An easy starter or light lunch - tender baby leeks wrapped in smoky pancetta then baked in a rich cheese sauce with a breadcrumb topping. Preheat the oven to 200°C, gas mark 6. Bring a large pan of water to the boil, add the leeks and cook for approximately 5 minutes or until just tender. Drain well and leave until cool enough to handle. Pour the cheese sauce into a small saucepan, stir in the mustard and gently heat for 1-2 minutes until just warmed through. Spoon some of the sauce into a large ovenproof baking dish. 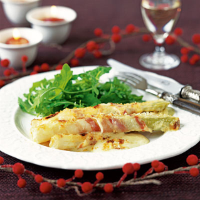 Wrap each leek in a slice of pancetta and place side by side in the dish. Pour over the remaining sauce. Mix together the Parmigiano Reggiano, breadcrumbs and chilli flakes, if using, and sprinkle over the top. Bake for 15 minutes until the top is golden and the sauce is bubbling. Serve with lightly dressed watercress or rocket leaves.